1. Drizzle the chicken breasts with the olive oil. Sprinkle ½ tsp. of the barbecue seasoning blend on the chicken and bake at 350⁰F for 30 minutes. Let cool, then chop into ½ inch pieces. Raise the oven temperature to 450⁰F. 2. While the chicken bakes, make the barbecue sauce. In a medium saucepan over medium-low heat, mix the remaining teaspoon of seasoning blend, ketchup, brown sugar, Worcestershire, vinegar, siracha, garlic, mustard and salt. Bring to a simmer and cook for 5-10 minutes until slightly thickened, stirring occasionally. Remove from heat. 3. Sprinkle the cooked chicken and onion over the pizza crust. 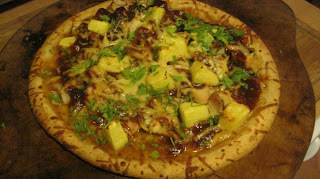 Add the barbecue sauce, top with pineapple, followed by cheese. 4. Bake the pizza at 450⁰F for 20 minutes. Remove from oven and top with the chopped cilantro. Let cool 5 minutes, cut into 8 slices, and serve.